Ethics and Eats is a CLE seminar series offered both onsite and online to help attorneys meet their annual ethics CLE requirements in one convenient lunchtime session. Also open to the general public and other professionals, programs in this series are approved by the Pennsylvania CLE Board for 2 hours of Ethics CLE credit, unless otherwise noted. 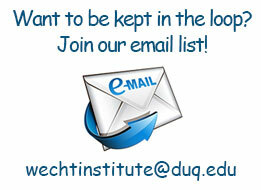 Please join our email list for updates. In this special, two-part seminar, Pennsylvania Supreme Court Justice David N. Wecht will share his views from the bench on a spectrum of ethical guidelines in the practice of law, while Duquesne University Professor of Criminal and Constitutional Law Wesley M. Oliver will discuss potential ethical issues arising from the emerging use of artificial intelligence to reduce subjectivity and bias in the determination of probable cause during traffic stops. Joining Prof. Oliver will be Arthur Crivella, president of Crivella Technologies, Ltd., and 3rd-year Duquesne Law School student Morgan Gray. This program is approved by the Pennsylvania CLE Board for 2 Hours of Ethics CLE credit. Please note that this program is also open to the General Public, both onsite and online. Just select the "Distance Learning" registration option.